Coastal Leak Detection, LLC is a Virginia Beach based company that specializes in swimming pool leak detection and repairs. Additionally we have over 10 years experience with both commercial and residential swimming pools. Our technicians are highly trained and experienced in the field of leak detection and we service hundreds of pools each year. Our goal is to be on the job within 24 to 48 hours from the request of service. Our state-of-the-art equipment allows us to provide our clients with efficient and affordable results. We service both Virginia and the Outer Banks of North Carolina. Call today to schedule an appointment for us to visit and repair your pool! No job is to big or too small for Coastal Leak Detection, LLC. We are fully equipped to handle most repairs on site. We also work closely with a network of contractors who specialize in other related fields. By maintaining these strong relationships, we feel confident in our abilities to provide our clients with the best service available. Although most of our repairs are done above ground, occasionally our clients have plumbing issues underground. This requires highly skilled technicians and sophisticated equipment to locate and repair damaged swimming pool lines. Coastal Leak Detection, LLC spends countless hours training and travelling to seminars / tradeshows to obtain the knowledge and equipment necessary for prompt, efficient results. Virginia has the largest number of vinyl pools in the country. 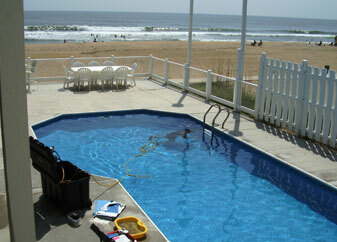 Our technicians service hundreds of vinyl pools every year. As a result of our hard work and determination, Coastal Leak Detection, LLC has become a leader in underwater inspection and repair of vinyl liner pools. 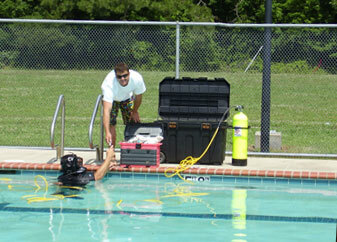 In the event of a complete line failure, our company is trained and qualified to replace most standard pool lines. Minor demolition and excavation may be needed to expose and replace affected areas. In accordance to the Virginia Graeme Baker Pool and Spa Safety Act, we remove old, non-compliant drain covers that are in swimming pools and retrofit them with new compliant drain covers.